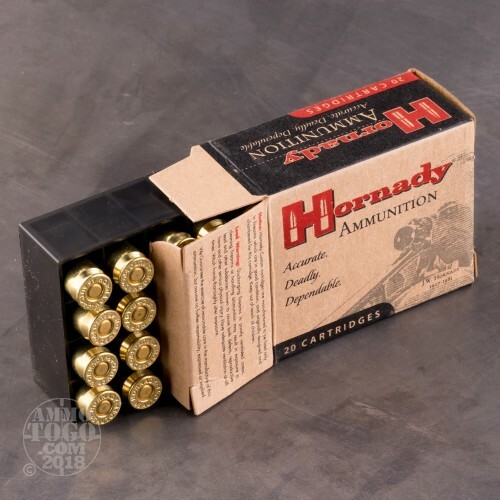 Founded as a simple, two-man operation in 1949, Hornady’s focus on innovation, quality, and performance has allowed the company to become a world-leader in the ammo industry. With excellent terminal performance and superior accuracy, Hornady’s Custom ammo is manufactured to give discerning shooters the advantage of hand-loaded precision in a factory load. 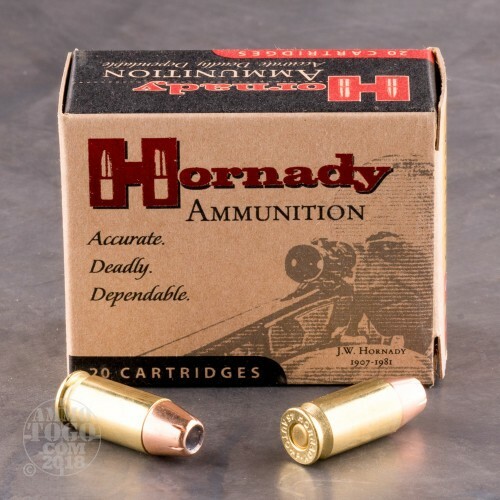 This package contains 20 rounds of Hornady Custom .45 ACP ammunition. Each round is loaded with a 230 grain Hornady XTP (eXtreme Terminal Performance) hollow point projectile. Featuring a swaged core surrounded by a gilding metal jacket, XTP projectiles are designed to ensure proper feeding in modern semi-automatic weapons. XTP projectiles also feature precise, symmetrical serrations, strategically placed to weaken the jacket and initiate controlled expansion even at low velocities. 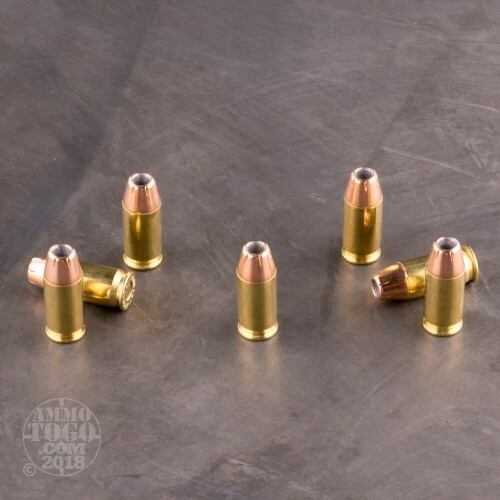 Delivering incredible accuracy, and the deep, terminal penetration necessary for one-shot effectiveness, these rounds are the top-of-the-line in self-defense ammunition. These +P overpressure loads produce a muzzle velocity of 950 feet per second and a muzzle energy of 461 foot pounds. These rounds are non-corrosive, Boxer primed, and feature reliable, clean-burning propellants, and reloadable brass casings. Expansion Diameter Compared to All 45 ACP (Auto) Ammo Tested MIN 0.45" MEDIAN 0.64" THIS AMMO 0.59" U.S. dime MAX 1.04"
Penetration Depth Compared to 45 ACP (Auto) Tested 0" 10" 20" 30" MIN 8.3" MEDIAN 16.7" THIS AMMO 17.9" MAX 32"
Has always worked great and functioned flawlessly. 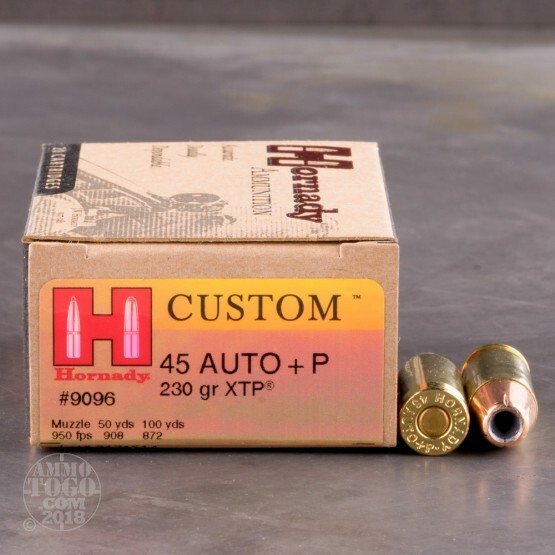 The Hornady custom 45 AUTO + P 230 gr XTP delivers as advertised, its accurate, reliable, affordable and cycles flawlessly, if your life depends on using your weapon use this ammunition, it's that simple. Be prepared.